For a collection of tiny protein filaments that grow from follicles in the dermis, us humans have a close relationship with our hair, often using it to show societal status or to express our personality. Throughout the English Civil War, Oliver Cromwell’s followers shaved their heads close to the bone in rebellion against the establishment and were given the nickname Roundheads as a result. Members of the Catholic Church still practice ‘tonsure’, a process involving shaving the hair as a sign of religious devotion. Some of football’s greatest moments regularly involve rose-tinted nostalgia about a player’s barnet; Roberto Baggio – or Il Divin Codino, surely the sexiest way a ponytail has been described – seemed keen to tone down his Mediterranean handsomeness by spending most of his career being chased by the ragged, brown smoke growing out of the back of his head. David Beckham’s ever-changing hair fascinated those who didn’t care for his impressive footballing career, as it ranged from its pinnacle (shaved and bleached, May 2007, no discussion) to the utterly disdainful (cornrows, May 2003, meeting Nelson Mandela). But what about those whose protein filaments reside elsewhere, or not at all? That’s who we’ve been celebrating here at the Football Ramble, as part of our 12 Eggs of Easter podcast series in the lead-up to Easter. We’ve scoured the bald bastions of the game, from Bobby Charlton to the entire 2001 Leeds Utd squad pre-Champions League semi-final, to find our favourite footballing eggs. And since I was granted zero input in those production meetings, I’ve taken a heavy dose of bitterness, mixed it with wild artistic licence, and dreamed up a batch of brilliant bald bastards: it’s the Football Ramble Bald XI. Am I the only one who, having been too young to fully remember the era of the FA Carling Premiership, mistakenly thought Fabien Barthez was a bit shite? He seemed to be on every ‘goals and gaffes’, ‘belters and blunders’ or ‘elasticos and erratic goalkeeping errors’ DVD I had as a kid, with one mistake or another. November 2001 against Arsenal was a prime example of this. He should’ve legitimately been awarded two assists, after serving up a pair of gimmes to his compatriot Thierry Henry. Thing is though, Barthez was actually a great keeper. Charging around his box like a deranged dog kept inside for too long, he was determined to stick a spindly arm, leg, head or glove at anything. He remains France’s record World Cup appearance-maker and, across five years, won the World Cup, European Championship and two Premier Leagues. A perfect encapsulation of this mad brilliance? This penalty save against Fulham: stands on his post like a bloke leering across a crowded dance floor, gets booked for time-wasting, whips up his shorts and saves the penalty. Genius. Mad, but genius. A heady mix of guile and thunderbastardry, this back four. Roberto Carlos bent the ball, and the physical laws of the universe, to his own will, so he’s 100% in there. Stam remains one of the scariest individuals I’ve ever seen; an egg hard-boiled in the innards of a volcano, if you will. Despite his aggressiveness, picking fights with everyone from Sir Alex Ferguson to Zlatan Ibrahimovic, Stam possessed an innate calmness in possession and great positional sense. As did Frank Lebouef, another cultured egg. A cultured egg who strolled around the 1998 World Cup final against Brazil like he popped out to walk his dog. Strolling out of the back four, nicking the ball off Bebeto and Ronaldo, and nonchalantly clipping 40-yard passes: glorious. And, from Leboeuf to le Roast Boeuf, Julian Dicks also gets in this continental tour de force. I can’t profess to have seen much of him but, watching him snarling around the pitch in a few videos, I think he’d fit in nicely. I mean, is Jaap Stam’s nickname ‘The Terminator?’ No, it is not. As a Newcastle fan, there is no XI dreamed up from my own imagination that does not have Temur Ketsbaia crowbarred in somewhere. Sure, there was the brief moment of sheer lunacy when he scored against Bolton and nipped off for a cage match with an advertising hoarding, but he had genuine talent. The ‘Mad Monk’ scored a couple of smashing goals for Magpies and, after signing, immediately went down to the Metro Centre to buy himself some boots. A humble and classy egg. Elsewhere in the midfield is a trio of incredibly serious-looking men. Yordan Letchkov, who featured in episode three of our 12 Eggs of Easter series, remains one of the most talented footballers to have come out of the Eastern Bloc. He was a lynchpin of the fantastic Bulgaria side that reached the semi-finals of the 1994 World Cup and brought technical guile and composure that contrasted his terrifyingly intimidating frame. Alongside him would be Zinedine Zidane, the most talented of this near-dozen. The man scored a Panenka penalty off the crossbar, in the World Cup final, against one of the world’s best ever goalkeepers – he can slot into whichever fantasy team he pleases. And, at the base of this oddly cultured bunch, is Thomas Gravesen, because he was hard as f*ck. YES. THE DIVINE EGG. L’OEUF. MONSIEUR BARTHEZ. There’s a lovely balance about this strike partnership. There’s one man, in Dublin, who consistently looked delighted to be involved at any given moment, and another, in Vialli, who never seemed even remotely arsed when he scored. He scored a fair bit, mind: 259 club goals across Italy and England, which is probably why he wasn’t that fussed when he notched one. Dion will be happy though, he always seems to be. Zidane cushions the ball from a Letchkov pass. Looks up, he sees them. Of course he does – the ball’s floated over the top. Dion Dublin goes steaming after it, bundles over both centre-halves and squares it to Gianluca Vialli, who rolls it into an empty net. This collection of hard-boiled eggs briefly let out a release of wild emotion and celebrate in front of their manager, Martin Jol. All bar Stam, who looks stoically into the middle distance. How does he like his eggs in the morning? Whole, with the shell still on. You can listen to our twelve special Easter episodes now via the Football Ramble feed here. 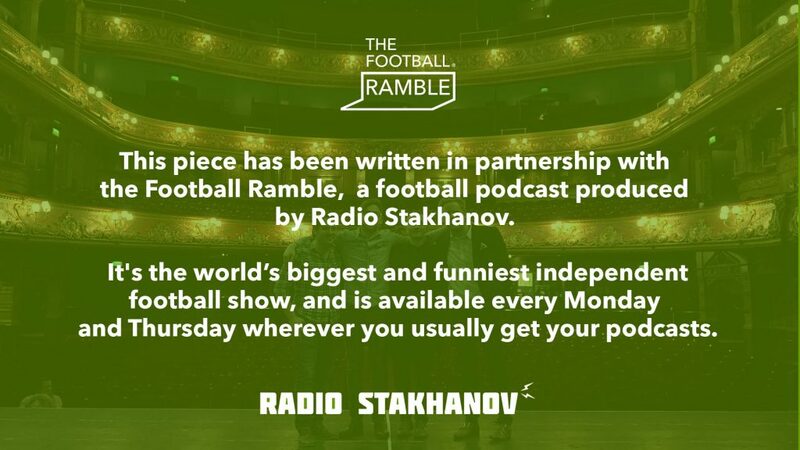 The Football Ramble are on tour this Autumn— buy your tickets here.